Product innovation featuring durian is aplenty in Malaysia. These innovations show the versatility in which durian can be applied in food and drinks and sometimes the new durian-based products are beyond the wildest imagination. Regalien Durian Butter Spread is a perfect example of how durian is applied in the butter spread category. 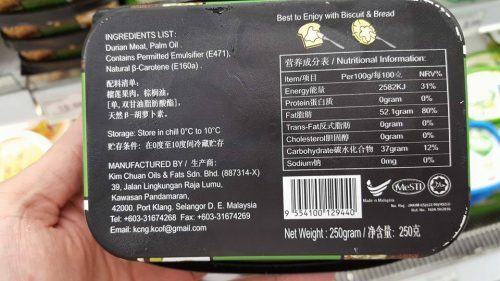 According to the packaging, the butter spread is ‘made with real Malaysia durian meat.’ The other ingredients are palm oil, permitted emulsifier (E471) and natural beta carotene (E160a). The product description can be misleading because it is actually a margarine (palm oil) and does not contain milk (butter). The product has to be chilled at a temperature of 0-10 degrees Celsius. The packaging describes the product is best to enjoy with biscuit and bread. The manufacturer is Kim Chuan Oils & Fats Sdn Bhd. The price for the 250g is RM 19.99 (USD 4.50), which is considered premium. As a comparison, the Naturel Fat Spread with Extra Virgin Olive Oil 500g is priced at RM 12.49 and the Olive Grove Lite Spread with Cholesterol Free-Olive Oil 500g is priced at RM 14.85. A normal Planta Multi-Purpose Margarine 240g is selling for RM 4.75. 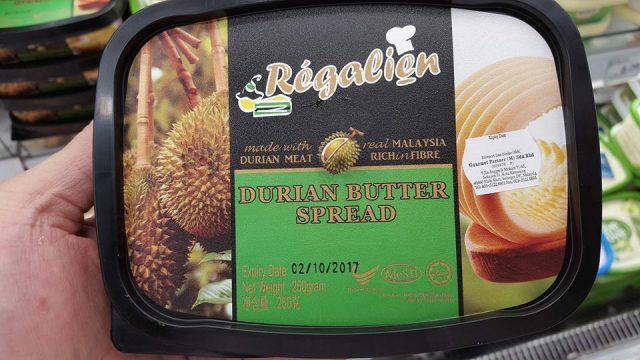 The Regalien Durian Butter Spread is available at Cold Storage.